I made 3 batches of jam this week. One was peach, from some frozen peaches I wanted to use up. We were out of peach jam, and that is Rob’s favorite, so I just made it when I made the other kinds. The second kind was strawberry. Rob bought me a flat of strawberries and I was also able to throw a small handful in the jam from our bushes. The third kind was berry-rhubarb. I used the remaining strawberries, rhubarb and about 1 cup of raspberries from our bushes. It is great. 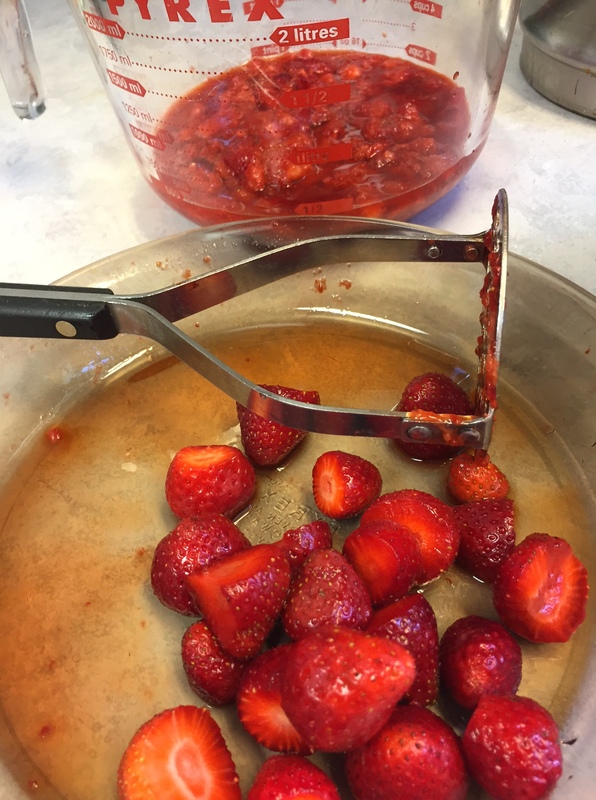 We got that recipe from the internet ( I just added raspberries to use them and get enough mashed berries), but it’s pretty typical–4 cups berries, 4 cups rhubarb, sugar, and 1 box Sure-Jell pectin. It turned out really tasty, and I was glad to use those raspberries, rhubarb and every berry from the flat of berries. I am hoping that as the new strawberry bushes grow throughout the summer, I will get some to freeze by the end of the summer. It’s easy to put even a small handful in a carton and add to it as berries ripen. We enjoyed the company of the nieces and nephew for 4 days and nights while their parents went to an out-of-town wedding. We went to a park, drove the big girls around to activities they were signed up for or wanted to attend, and spent hours helping with a huge rummage sale at the church. We had many more frugal, fun activities planned, but ran out of time. The kids have been earning money in various ways so they can go to Mexico on a mission trip in August. This was a big project, and I haven’t heard the final word on how much money they earned at this sale, but at last count, it was over $6,000. I’m excited to hear the final count! In the meanwhile, the garden continues to grow nicely. Rob did get in there and till one morning, and we put up a little trellis for the pole beans to climb. Half of these are Purple-podded pole beans and the other half are Blue Lake. Pole beans will produce until frost, which will mean we will have fresh beans for a long time and I won’t have to can as many. We’ve been eating lettuce frequently and I picked a gallon of snow peas. I harvested a little broccoli and made broccoli soup. There have been a few raspberries each day. Throughout the busy, busy week, we were able to pack picnics and cook at home. I used my Instant Pot to make spaghetti sauce from scratch one busy night and we ate that and the soup several times. We also had sandwiches frequently. By Saturday night, Rob grabbed a little Chinese food for me, and Taco Bell for the others. I was too tired to cook. I was even too tired to cut the crust off of Michaela’s peanut butter sandwich. I cut it into quarters and I told her she had to bite out the middle and get rid of the crust herself. 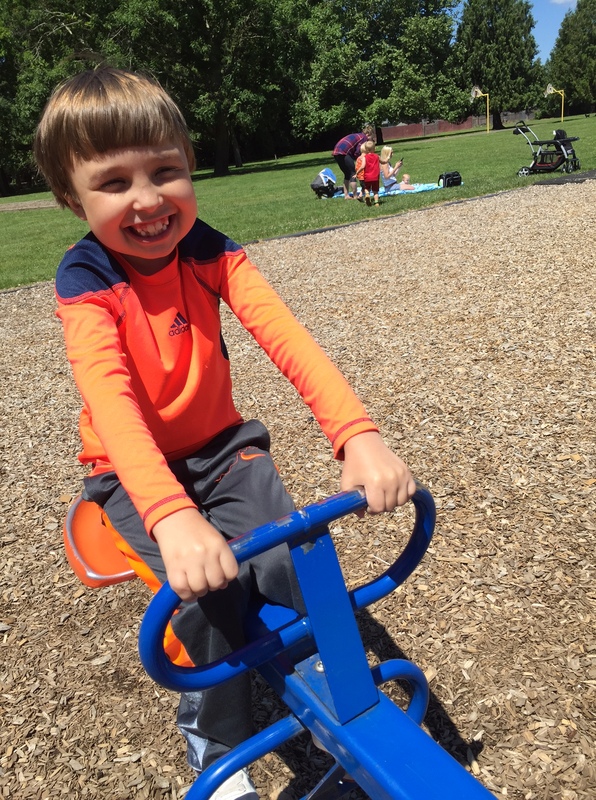 (You have to understand autism to understand that that is a big deal to her–but I was proud of her–she went with the flow) We got back to our house around 10, and I then slept like a rock and am now cheerful and ready for a new day! It was a good week. Sounds like an amazing week. Congratulations on the great success of that rummage sale. Thanks. The final tally came in at $7,200. I’m thrilled! Here on the east coast we have been hearing about the incredible heat our west coast friends have been enduring. It seems that last summers whether has done a flip flop since all we have had is rain and more rain and many cool days. I hope you have a break soon! Strawberry rhubarb is probably my favorite jam. I think it has been years since I have had that. It may be time to remedy that! My only good source for rhubarb is frozen but it works. I cannot even imagine a yard sale of that scale! I hope the end count is a real help to all the kids. We gained 400 square feet of space by cleaning out our garage. A whole bunch of stuff went to the thrift store and lots of good stuff to the neighbor kids. This week we have a solid schedule including doctor appointments for hubby and dentist for both of us. Then on Friday we are out of here for 10 days to the lake for the 4th of July. Can’t hardly wait! I’ll bet that cleaning felt great!! I’m glad you can go to the lake. Sounds fun! I am thrilled that the rummage sale earned so much money for the mission trip! Your jams do sound good and are making me think I should get some going too since I have rhubarb, raspberries and strawberries. 😉 That may have to wait until tomorrow though since I have expended most of the energy I have today already and still need to make dinner later. Reading all you have done this week has made me tired! I suppose what impressed me the most was that you were able to get jam made while taking care of little ones. That is superhuman in my opinion. When you have time, no rush, I would like to see how you use your snow peas. I have grown them before but only used them in stir frys. I seriously think that because I have so many children (8), and have always been very involved with the various nieces and nephews, plus 4-H clubs, and other little friends, multi-tasking has always been a part of my life. 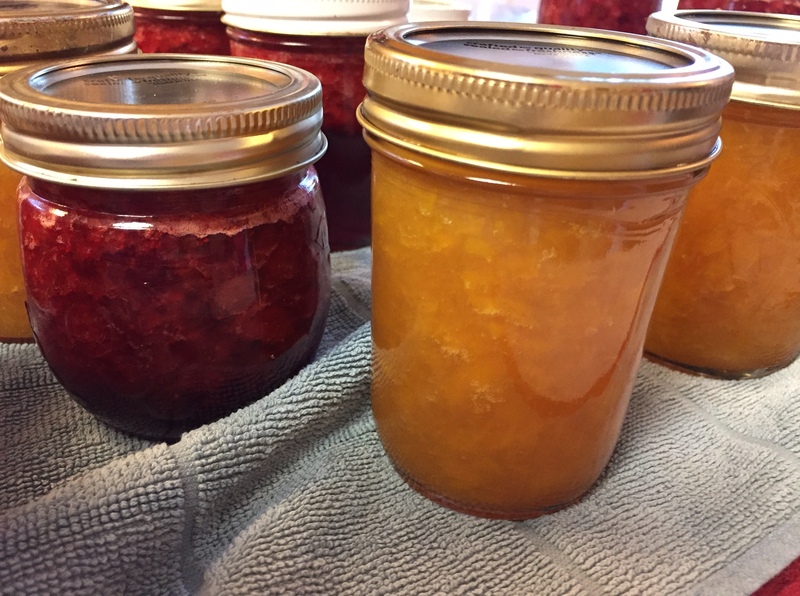 The truth is, I enjoy food preservation–both canning and freezing. I’ve always done it early in the morning, and late at night. It’s kind of an useful hobby for me. In fact, once, years ago, I counted my jars of jam and I had 90 little jars. 90!!! For Pete’s sake–I did not need 90, so I really cut down after that, even though it was fun to make. I didn’t get to can last year, and so am looking forward to it this year. If I did not truly enjoy it, I don’t think I could have gotten it done last week, either. I find it harder and harder to keep up my pace as I get older, but I would challenge anyone to feel energetic after THAT week!! Thankfully, we don’t have as many children left at home, so use less jars of everything. *You can blanch and freeze the extra, but they aren’t super great after freezing–not crisp anymore, but sometimes I do it anyway because I get so many. I like the cashew chicken recipe, it is making me hungry now. Once I blanched them and they were mushy. I thought I had done something wrong and ended slipping them in a soup. Sauted in butter and garlic is a new idea and it sounds good. I think I will plant some this fall and see how it goes. They love the spring and fall weather the best. During our recent hot spell of weather, mine went over the hill quickly. I have another planting coming along and will probably wait a few more weeks to plant another one. We enjoy them, but my frozen ones are always mushy, too. Wait, this is July 3rd. You are going to plant them at the end of this month? Won’t it be too hot? Will they germinate is this heat? I saw everyone hot at the zoo but maybe your weather is milder than mine (lower, middle Tennessee). I think our climate is very mild as a whole. We pick up a lot of marine air from the coast. That’s why we whine so much when it does get hot. 90 and 100 degree days are not common. It’s why I don’t remember getting watermelon to grow successfully. If I plant fall crops (things like snow peas, green onions, extra lettuce, etc.) I try to do it 6-8 weeks before frost. That usually happened early to mid-October at my old house. It may be later here. So, mid-late July works as long as the crop gets ready pretty quickly. Although lots of those things can take a little frost, I try to leave a bit of time to harvest something before they get frozen solid. I had some success here getting some things to overwinter last year. I always do lots of succession planting on lettuce, beans, and a few other things. I try to have fresh veggies for as long as possible. Things like cucumbers or zucchini won’t take any frost, so if I want extras of those because the old ones might succumb to powdery mildew, I’d best get them planted asap! I will be watching how it works for you. I might try planting at the same time to see what happens. Today, I had some time, so went out into the garden for a long time this morning. I pulled up all of the snow peas, since they seemed finished, and noticed that the new ones are blooming. So, I went ahead and planted some more. I probably will still do one more planting later, as long as I get my act together. The garden is full, so something else will need to come out for me to plant more snow peas. This morning, I also planted new lettuce, basil, cilantro, pole peas, and one small row of bush peas. The pea seeds were quite old, so I planted them VERY thickly, and we will see if anything happens. I also planted a few beets, a fresh hill of zucchini and one of cucumbers. 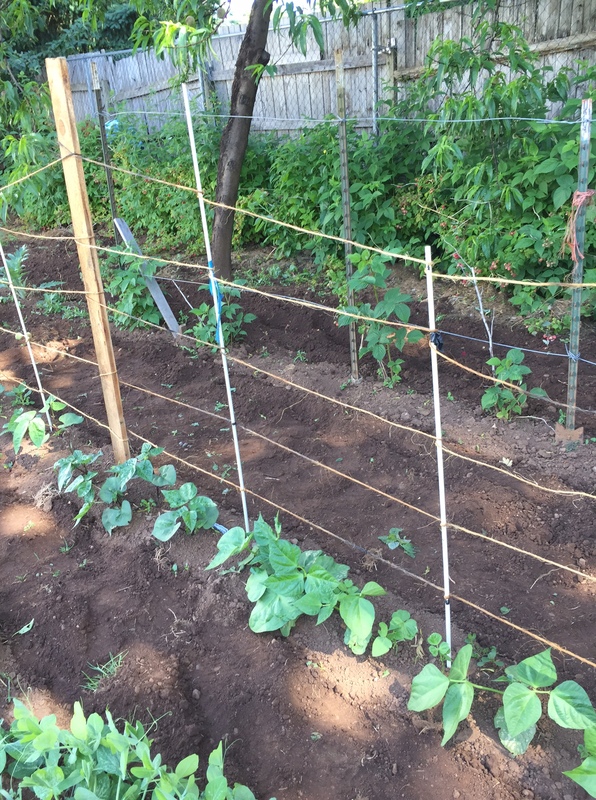 To do this, I removed a long row of bolting lettuce, 2 small rows of old snow peas, and had Rob till up those area, plus any places that were not full, like where the cabbage used to be. Then, I filled in any gap, no matter how small, with seeds. I figured I don’t need much new cilantro or basil, just a bit coming along all the time. Last summer, I never lacked for lettuce from spring to fall, and I hope to do that again.